I’m updating via iPad with very swollen fingers from Boston; my birthday trip about to come to a close and my return to life’s responsibility a short sleep and a long bus ride away. I visited Thomas Hooper at Saved on Wednesday 3rd August to do a little work on my fingers; bringing him abstracts and fragmented symbolism and asking him to work something up based on very little cohesive information. To his credit Thomas was able to make something solid out of the more uncemented ramblings I presented him with and whipped up this piece and in no time flat had it on my fingers. Despite the discomfort I left my visit happy; freshly tattooed and in the company of my sister and brother in law and en route to seeing an old friend who was visiting Boston. 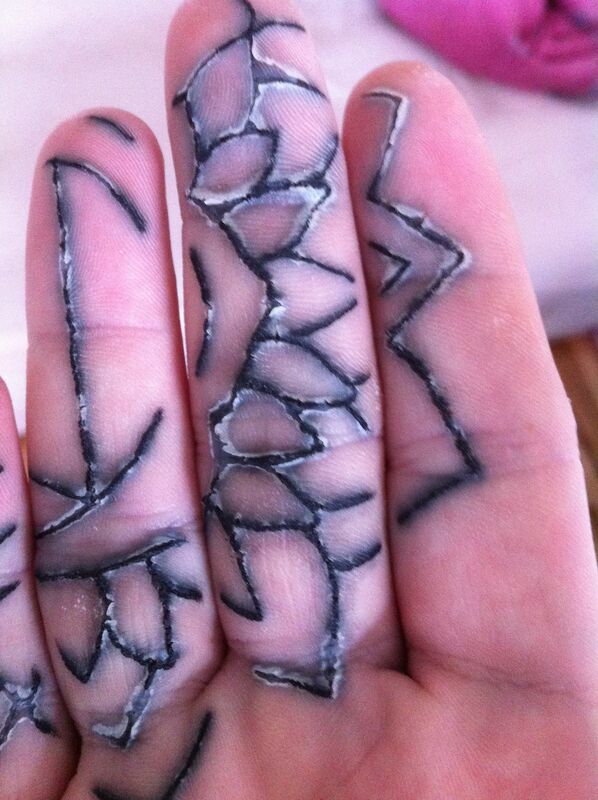 Thomas was kind enough to penguinize my hands to keep me safe from the elements…. Making subway and bus travel interesting to say the least. Such and amazing few days that my current swollen finger situation prohibits me from talking about, but tomorrow I head home to Bailey and will hopefully be able to make regular updates on the healing process of the fingers. 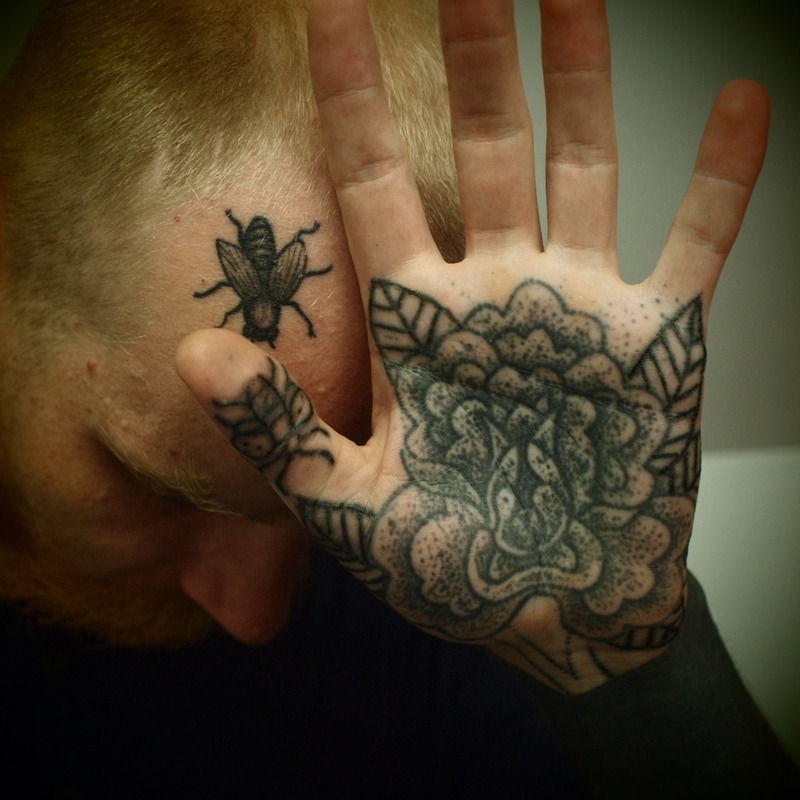 This amazingly realized palm tattoo (with matching forehead) comes from Guy Le Tatooer. The stipple technique really adds something to it. You can find more of Guy’s work here. 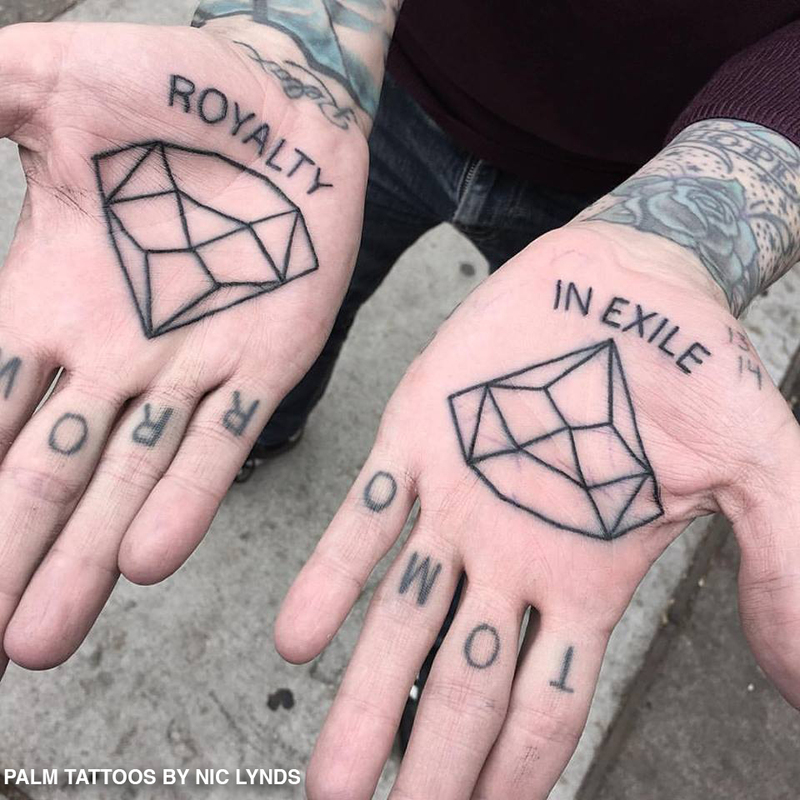 There’s no doubt that palm tattooing is enjoying a massive upswing in popularity these days; while they were few and far between twenty years ago, you’re likely to spot them randomly in the strangest of places. Just last week I saw a set of beautifully tattooed palms while at the farmer’s market here in Philadelphia, and came home to see a few sets in my tumblr feed; effectively seeing more tattooed palms in one day than I used to see in a year. 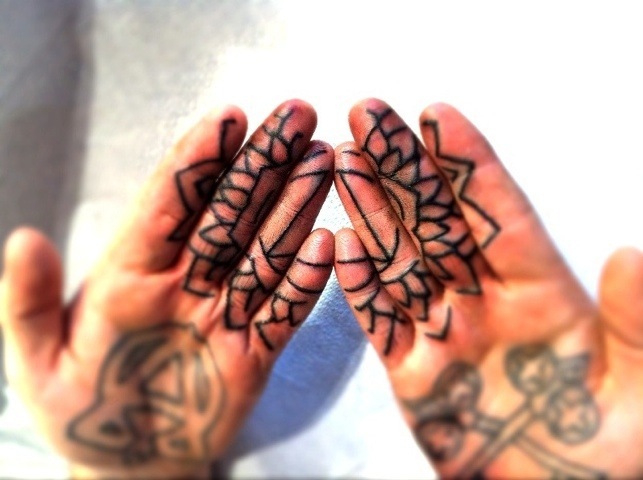 My own palms, done by Thomas Hooper, are among my favorite of my own tattoos despite being horrible to get and even worse to heal. 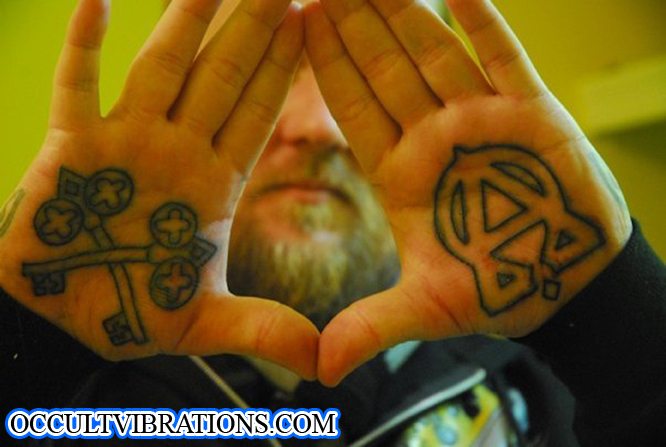 If you’ll forgive the expression- you have to earn palm tattoos if they’re done correctly. And if they’re not… congrats.. you get to do them again. And again. Not something that I’d be interested in. So while not a regular feature, I’m going to occasionally run Palm Sunday updates as content permits. 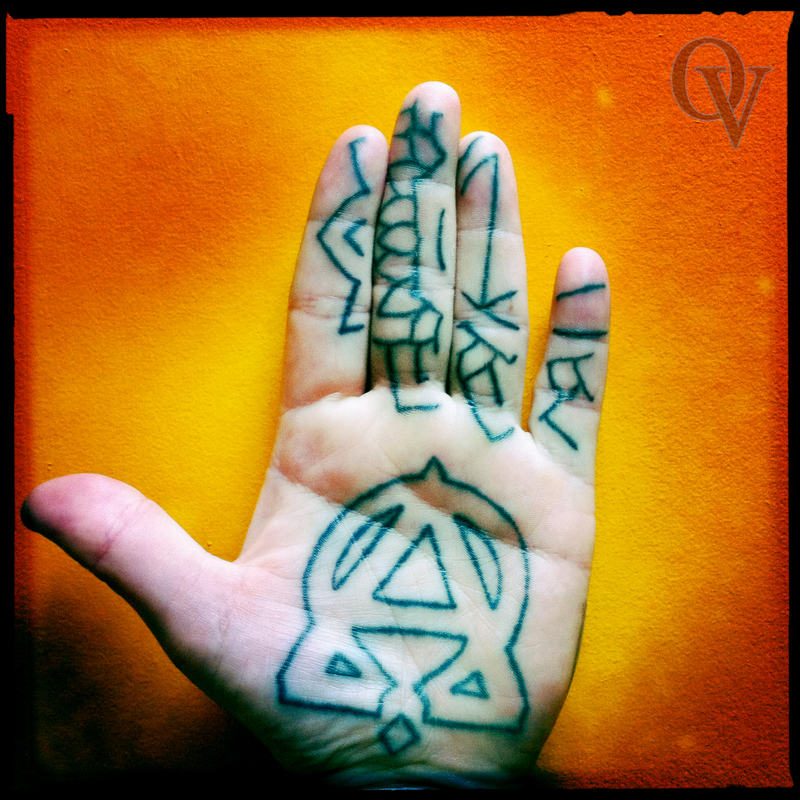 Feel free to submit your own palm pictures to Occult Vibrations.